The Advanced Spaceborne Thermal Emission and Reflection Radiometer (ASTER) is an imaging instrument aboard the Terra satellite, launched on December 19, 1999, as part of the National Aeronautics and Space Administration's (NASA) Earth Observing System (EOS). The ASTER sensor consists of three subsystems: the visible and near infrared (VNIR), the shortwave infrared (SWIR), and the thermal infrared (TIR), each with a different spatial resolution (VNIR, 15 meters; SWIR, 30 meters, TIR 90 meters). The VNIR system has the capability to generate along-track stereo images that can be used to create digital elevation models (DEMs) at 30-meter resolution. Currently, the only available DEM dataset for Afghanistan is the 90-meter-resolution Shuttle Radar Topography Mission (SRTM) data. This dataset is appropriate for macroscale DEM analysis and mapping. However, ASTER provides a low cost opportunity to generate higher resolution data. For this publication, study areas were identified around populated areas and areas where higher resolution elevation data were desired to assist in natural resource assessments. The higher resolution fidelity of these DEMs can also be used for other terrain analysis including landform classification and geologic structure analysis. For this publication, ASTER scenes were processed and mosaicked to generate 36 DEMs which were created and extracted using PCI Geomatics' OrthoEngine 3D Stereo software. The ASTER images were geographically registered to Landsat data with at least 15 accurate and well distributed ground control points with a root mean square error (RMSE) of less that one pixel (15 meters). An elevation value was then assigned to each ground control point by extracting the elevation from the 90-meter SRTM data. The 36 derived DEMs demonstrate that the software correlated on nearly flat surfaces and smooth slopes accurately. Larger errors occur in cloudy and snow-covered areas, lakes, areas with steep slopes, and southeastern-facing slopes. In these areas, holes, large pits, and spikes were generated by the software during the correlation process and the automatic interpolation method. To eliminate these problems, overlapping DEMs were generated and filtered using a progressive morphologic filter. The quadrangles used to delineate the DEMs in the publication were derived from the Afghan Geodesy and Cartography Head Office's (AGCHO) 1:100,000-scale maps series quadrangles. Each DEM was clipped and assigned a name according to the associated AGCHO quadrangle name. The geospatial data included in this publication are intended to be used with any GIS software packages including, but not limited to, ESRI's ArcGIS and ERDAS IMAGINE. 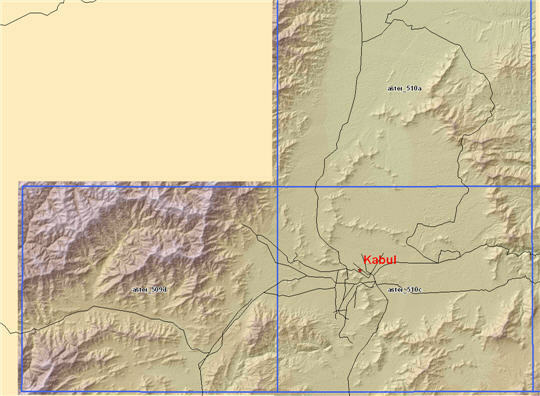 Example of shaded relief grid created from three of the DEM quadrangles surrounding Kabul, Afghanistan. Please note: The ERDAS IMAGINE and ESRI interchange files are too large to be included online. The complete DVD can be ordered from the USGS Store. The product number is 208239. This folder includes the 36 30-meter-resolution ASTER DEMs stored in ERDAS IMAGINE (.img) format and projected in UTM Zone 42 North, WGS 84 Datum. This folder includes the 36 30-meter-resolution ASTER DEMs stored in ESRI interchange (.e00) format and projected in UTM Zone 42 North, WGS 84 Datum. Afg_ASTER_Index_Map.pdf – Index map stored in Adobe PDF format displaying the locations and quadrangle numbers of available ASTER DEMs included in this publication. Also contains the map in jpeg format. Afg_Shaded_Relief_Map.pdf - Shaded relief map of the ASTER DEMs produced for this publication. Map is stored in PDF format. Also contains the map in jpeg format. You will need Adobe Reader to view this file. Download a copy of the latest version of Adobe Reader for free. Image files used for this Web page. ASTER_DEMs_Metadata – FGDC-compliant metadata file for the ASTER DEMs. 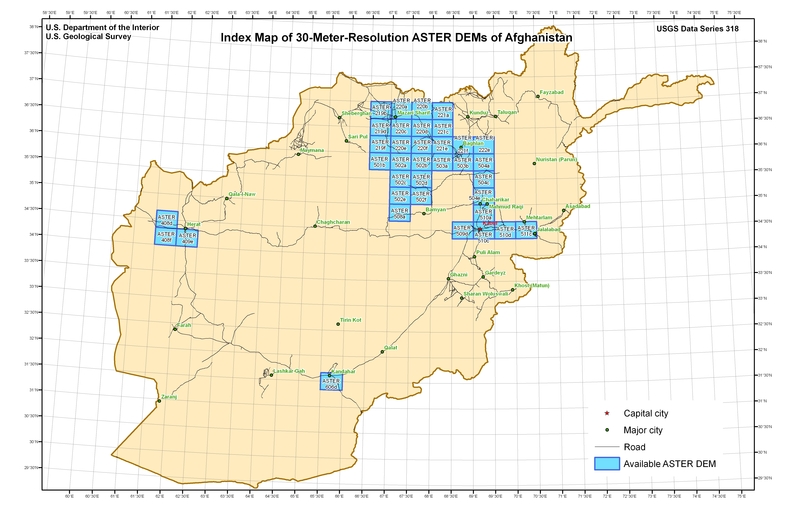 Afg_ASTER_DEM_Index.shp – An index shapefile of all available 30-meter-resolution ASTER DEMs of Afghanistan. Readme.txt – Text-only readme file that explains the contents of the disc. Contact.txt - Text-only file that provides scientific contact information for any questions regarding this publication. Disclaimer.txt - Text-only standard disclaimer for this publication. 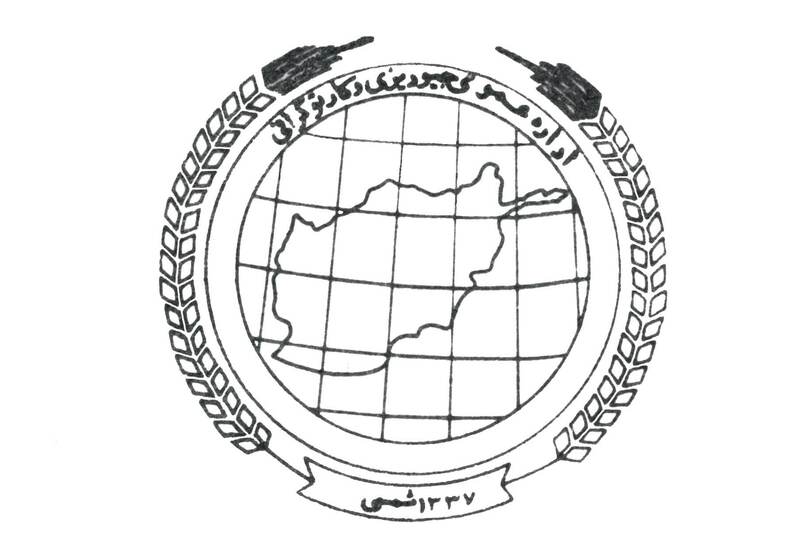 Chirico, P.G., and Warner, M.B., 2007, ASTER-derived 30-meter-resolution digital elevation models of Afghanistan: U.S. Geological Survey Data Series 318, 1 DVD. This database has been approved for release and publication by the Director of the USGS. Although it has been subjected to rigorous review and is substantially complete, the USGS reserves the right to revise the data pursuant to further analysis and review. Furthermore, it is released on condition that neither the USGS nor the United States Government may be held liable for any damages resulting from its authorized or unauthorized use. References to non-USGS products, services and tradenames are provided for information only and do not constitute endorsement or warranty, express or implied, by the USGS, USDOI, or U.S. Government.